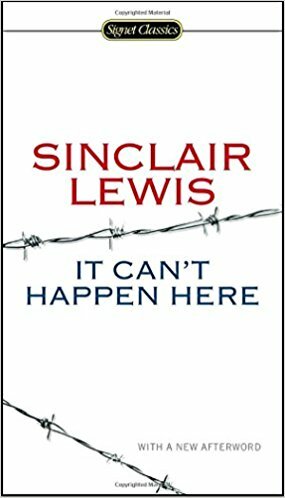 It’s not often that I read and review fiction, but with the Trump presidency devolving into a desperate, rabid beast it was time to read “It Can’t Happen Here” by Sinclair Lewis. The book, which was written in 1935 as Fascism was rising in Europe, accurately predicted the rise of an authoritarian like Mein Trumpf. The two main opposed characters are small town Vermont newspaper publisher Doremus Jessup, and eventual dictator Berzelius “Buzz” Windrip. Windrip is fashioned somewhat in the likes of Huey Long, a barnstorming Democrat in the populist vein. He promises an orderly “chicken in every pot” working man’s utopia, cloaking the emerging movement in a militia structure that seems to operate independently of political control. Windrip has written his manifesto “Zero Hour” in which he outlines his philosophy to the masses. Meanwhile, back in sleepy Vermont, newspaper editor Doremus Jessup watches cautiously as Windrip firms up what is becoming his dictatorship. It is in this realm that author Sinclair Lewis paints a broad picture of the town and it’s residents. In fact, he loads us up with so many individuals it slows the plot down a bit. Honestly, it took almost 200 pages to get to the meat of the story but Lewis really finds his voice and the novel shifts into serious action. Or at least as much action as you can find in a sleepy Vermont town. The dictatorship clamps down on border crossings, and an escape to Canada by Doremus and his family is foiled. His newspaper is seized, but among executions of dissidents Doremus and his cohorts start an underground paper and begin organizing resistance cells. Without giving away the plot, I can only say Sinclair Lewis leaves the conclusion somewhat unresolved, placing the responsibility and outcome on the people, and the same kind of resistance experienced by over half our country in the era of Trump. Windrip was a blustery barnstorming speaker who wrote “Zero Hour”. The Russiagate investigation of Trump is outlining some very dubious financial dealings. Trump is constantly attacking the press, threatening to pull their credentials. * Windrip had “The League of Forgotten Men”. Trump has “The Alt-Right”. Signs at Trump Rally: “Make America Great Again”. * “When Buzz gets in, he won’t have any parade of wounded soldiers. That’ll be bad Fascist psychology”. Starting with the G.W. Bush administration, taking pictures of soldiers coffins was forbidden. Trump is obsessed with race, a southern border fence, and travel bans for people from certain countries. Trump is issuing broad mandates on trade and manufacturing. Trump promises to bring jobs back to his “poor white trash” worshipers. Well, that’s pure Trump in a nutshell. Trump at rally: “I love the uninformed”. * Windrip has a paramilitary called “The Minutemen”. The term dates back to the American revolution, but more recently was known as an armed, militant off-shoot of John Birch Society ideology. Trump has his “alt-right” thugs and armed militia groups that have been a presence at recent demonstrations. I could go on and on. It seems the patterns associated with fascism repeat themselves over and over, in multiple versions of society. The populist appeal, the bait-and-switch, the disappointment leading to the scapegoating of a given underclass, and violence. “It Can’t Happen Here” was a bit of a difficult read at the beginning. It’s a little overloaded with names of characters that are only tangentially involved and has line after line of old-time Vermont witticisms. But I am really, really glad I read it, the second half totally grabbed my attention. The version I got was a smaller Signet Classics pocketbook. I bought another for a friend that was in larger scale and print. If you can wade through some archaic language, if you care to marvel at how spot-on Lewis was in this prophetic tale, this book will teach us a lot. (Doremus) “He was afraid that the world struggle today was not of Communism against Fascism, but of tolerance against the bigotry that was preached equally by Communism and Fascism. But he saw too that in America the struggle was befogged by the fact that the worst Fascists were they who disowned the word “Fascism” and preached enslavement to Capitalism under the style of Constitutional and Traditional Native American Liberty. For they were thieves not only of wages but of honor. To their purpose they could quote not only Scripture but Jefferson”. This entry was posted on May 13, 2018 at 6:08 pm and is filed under Book review, Tell the truth and run !. You can follow any responses to this entry through the RSS 2.0 feed. It is often the case that the only difference between fiction and fact is the passing of time. “without giving away the plot”!!!! John, the book was written in 1935! I think the plot and anything else in the book is safe since you are the last person to read the book in 50 years. History repeating itself. There are few true historians left and fewer still people who listen to them.